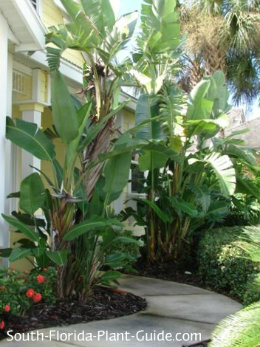 Nothing says tropical like white bird of paradise, with its enormous leaves, upright stems and exotic flowers. The unique white bird grows in a clumping form and needs a large area in which to spread out and unfurl its big leaves. The plant blossoms on and off during warm weather, with flowers that bear an astonishing resemblance to a bird's head. The blooms, however, are less important to your landscape than the ultra-tropical look created by the beautiful foliage. The leaves look like an elite version of a banana plant. A white bird of paradise can be a real showpiece in a landscape. 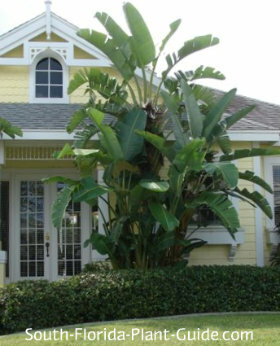 It can be used to accent tall pillars near a home's entrance, add a tropical note as a backdrop in a mixed bed, or as a striking container plant on the patio or pool deck. 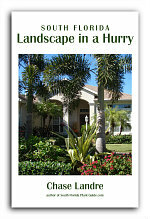 The mistake most people make with a white bird - and many other South Florida landscape plants - is not planning ahead for growth. This is a big plant. When mature, it's going to be over 20 feet tall by at least 6 feet or more wide, and it can tower over a small one-story house. Leaves of a white bird of paradise can become chewed up from wind damage, making the plant unattractive. Try to place it in an area protected from strong winds. Because it's a clumping plant that grows multiple stems, you can cut down some of the stalks without hurting the plant. This plant is sometimes confused with Travelers Palm because they look similar when young, but birds won't grow as big and don't form a palm-like trunk. 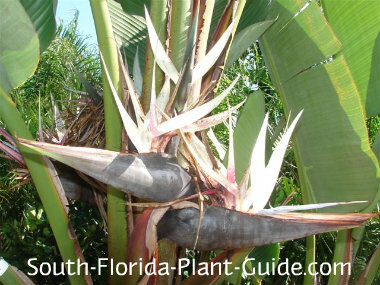 White bird of paradise is a moderate grower to about 25 feet. 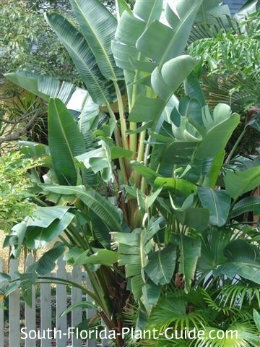 These tropical plants do best in Zone 10, though in Zone 9B you can grow them in a large containers that can be moved indoors during cold weather. This plant does fine in sun to partial shade. Add top soil or organic peat humus to the hole when you plant. You can also add composted cow manure to the mix. Water on a regular basis with enough time for the plant to dry out a bit between waterings. 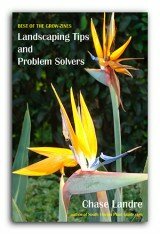 Avoid placing a bird of paradise in soil that doesn't drain well. Keep mulch away from the base of the plant to keep it from staying too wet. Trimming off old leaves and stems occasionally is pretty much all that's necessary for a white bird of paradise. However, you can thin the plant out or cut back for size by cutting off the largest stalks at ground level. Pups sprouting from around the plant's base can also be removed. Fertilize 3 times a year - in spring, summer, and autumn - with a fine quality granular fertilizer. 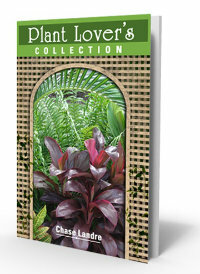 Place these plants 4 or 5 feet apart. Come away from the house at least 4 feet to allow the tall stalks room to grow without interfering with soffits and roof gutters. Allow some room for nearby plants so they won't be overtaken. Avoid placing close to the A/C or other outdoor household equipment. A white bird will grow well in a large container but at some point it will outgrow the pot. 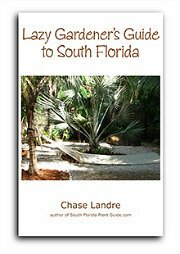 COMPANION PLANT SUGGESTIONS: Yellow elder, selloum philodendron, ixora, croton, areca palm, downy jasmine, foxtail fern, and cordylines.